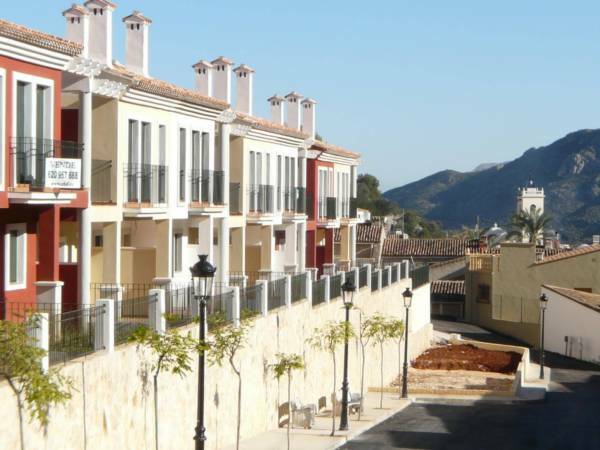 3 bedroom linked villas on a lovely complex with residents’ pool. The properties are distributed over 2 levels comprising: pergola parking, porch, ‘L’ shaped lounge-diner, 3 bedrooms, shower room, bathroom, kitchen, 2 terraces and private garden. A 2 bedroom, 2 bathroom Detached Villa offered for sale in superb decorative order throughout having been recently refurbished to a very high standard by the present owners. Located in a quiet cul de sac within walking distance of Alcalali the property has a level access to the front door. The main accommodation is on one level and comprises an entrance hall, lounge/dining room, open plan kitchen, two bedrooms and two bathrooms. The main bedroom has air conditioning and a door opens on to the sun terrace. Both bedrooms have built in wardrobes. A hardwood staircase leads from the living room to a first floor mezzanine which could be used as a third bedroom. The property is in very good condition throughout and benefits from gas fired radiator central heating. The villa has a large mainly level plot with a large rear sunny terrace with a few stairs leading to a large gravel area with summer house and covered seating area. To the side of the property a driveway gives parking for two cars. A spacious 3 bedroom, 2 bathroom detached villa located on a peaceful residential development on the edge of the village of Alcalali and surrounded by open countryside. A few steps leads down to the property which has accommodation on one level comprising an L-shaped lounge/dining room with wood effect fire, fitted kitchen, three bedrooms and a family bathroom. The main bedroom has an en suite bathroom. To the front of the villa a covered naya overlooks the swimming pool and has lovely views of the mountains. The property has a level plot with a large secluded swimming pool and mature gardens. This is a lovely home in immaculate condition and in a private location. Charming, traditional villa located a 5 minute drive from small typical village of Alcalali and 10 minute drive from the town of Jalon with all its amenities, bars and restaurants and famous for its wine producing and the Saturday rastro (market). The property rests above a very tranquil urbanization with wooded mountain as back drop, enabling a unique micro-climate which is a few degrees cooler in summer and few degrees warmer in winter and offers great open mountain and valley views. The villa is accessed through a covered porch which opens up into an inner hallway. The inner hallway leads to two double bedrooms, a bathroom and a master bedroom with en-suite shower room. The hallway opens up to a spacious and bright, semi-circular lounge/dining room with wooden beamed ceilings and a modern pellet burner. From the lounge there is access to the spacious, modern fully fitted kitchen with larder and a back door which leads to the garden and BBQ area. From the lounge a few steps lead to a semi-circular naya with a glass curtain making this a lovely area which can be used and enjoyed all year round. From here a further short flight of steps lead to the sunbathing terrace and the 8 x 4 meter pool with stunning views over the valley and mountains beyond. In addition there is a summer kitchen with BBQ and a pergola for al fresco dining with friends and family. There is off road parking for two cars plus a private garage. The lovely gardens offer almost complete privacy and are planted with low maintenance Mediterranean shrubs and fruit trees, and also has a lovely lawned area. There is central heating through-out, double glazing and built-in wardrobes. This charming villa would make an ideal family home or a retirement home being located in a very tranquil and scenic region, just a 30 minute drive from the coastal beach resorts of Calpe, Javea and Moraira. And just a 20 minute drive from the access to the motorway to either Valencia or Alicante with all their amenities and the major airports.